To begin this quest, speak with Hassan in Al Kharid Castle. To begin the quest, walk to Al Kharid or, on a Member's World, teleport there using a Ring of Duelling or an Amulet of Glory. 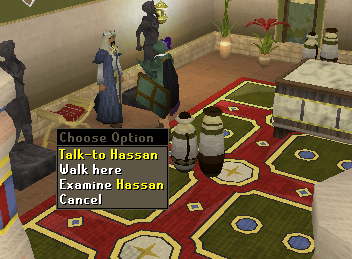 Once in Al Kharid, go to the Palace and walk south to the large room and talk to Hassan. Ask Hassan if he can use some help. He will tell you he can and requests that you go and visit Osman to the north of the Palace near the well. Tip: If you don't have water yet, you can ask Hassan 'how they survive the heat'. Then he'll give you a Jug of Water. This will work just as well as a Bucket of Water. Osman will tell you that Prince Ali has been taken captive by Lady Keli. Osman has a plan for you to help get him out. He will give you a list of items that you will need for the plan. You are going to need to tie up Lady Keli and disguise the Prince as her. To do that you will need a rope, a skirt, a wig, and something to color the Prince's skin. You will also need soft clay and a bronze bar to make a copy of the jail key. 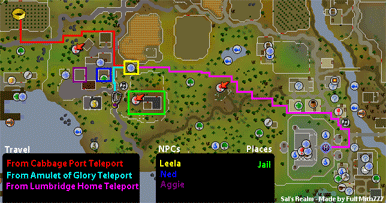 Head to Draynor Village either by walking, using an Amulet of Glory (4) teleport, or using a Cabbage-Port teleport. Once there talk to Leela, Osman's daughter. Leela can be found just south of the wheat field and north of the jail. She'll mention she knows of your will to help. She'll also tell you more about the disguise. First let's take care of getting the rope. If you already have a rope, skip this part. Leela mentioned there was a good rope maker in Draynor, and apparently she was referring to Ned. Ned can be found in his house which is the closest house west of the musician. Ned also starts the Lumbridge Tasks. Talk to Ned to find out he'll sell you rope for 15gp or make some for 4 pieces of wool. If you want to save 15gp, go east to the sheep farm with a pair of Shears. Shear 4 sheep, then go to Lumbridge Castle. Go to the second floor and look for a spinning wheel. Spin the wool on this to make 4 Balls of Wool. Then go back to Ned. While you're by Ned, ask him if he can make other things from wool. He'll say he is sure he can and ask you what you're thinking of. Tell him you want a wig. He says he can do it, but he'll need 3 Balls of Wool. Give him the wool and he'll make you a wig. Now use your Yellow Dye on the wig. If you don't have Yellow Dye yet, head to Aggie (refer to map above). Talk to her and click for 'more' options. Ask her if she can make dyes for you. Then tell her you'd like yellow. She'll tell you she needs 2 onions and 5gp, give it to her (if you don't have onions, you can get some from the patch east of Rimmington). Now, if you haven't done so yet, use the Yellow Dye on the wig to get a blonde wig (the name of the item won't change, but the color will). Stay near Aggie. Ask her about the Prince Ali Rescue Quest. Your character will automatically ask her if she can make skin paste. Aggie will need a Bucket of Water, Ashes, and Red Berries. If you have all of these, have her mix together some skin paste. If you don't have these items yet, you'll need to get them. Ashes: Take out an axe and a tinderbox. Cut some wood and burn it. Wait for the fire to die out and pick up the ashes. Bucket of Water: Buy a bucket from a General Store. Then take the bucket to a fountain. Use the bucket on the fountain. Redberries: You'll need to go east of the stone circle south of Varrock. There will be Red berries on the ground next to the mine. Now head back to Aggie and have her make the skin paste. To get the skirt you'll need to go to Varrock. 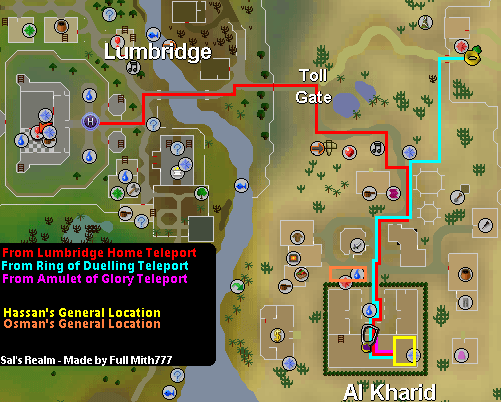 Either teleport there or walk, but you'll have to make it to the center of Varrock. Once there, go to the Clothes Shop, southwest. 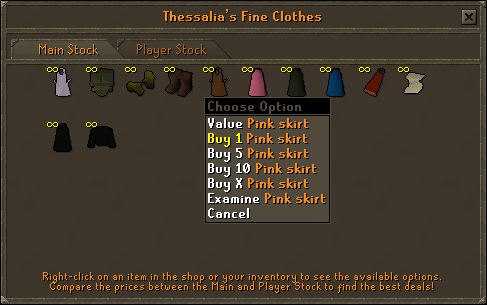 Trade with Thessalia and buy a Pink Skirt for 2gp. After that, start asking about the plan. After that ask her if she thinks other people will try to get him out. Finally, ask her to see the key. As you touch the key, you'll take an imprint of it. Your Soft Clay will now be a 'Key Print'. Now head back to Osman at Al Kharid. Make sure you have the Key Print and Bronze Bar with you. Osman will take the Print and Bar and tell you to get the key from Leela. 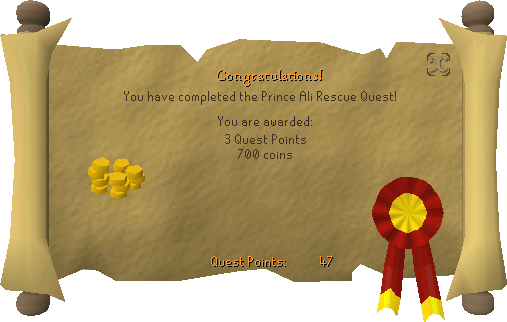 Now go back to Draynor Village. Speak with Leela and she'll give you the key. Tip: If you accidentally drink one of the beers, you can refill your glass from the barrel in the northern most house of Draynor Village. Prince Ali will mention his father will pay you well and then leave. You'll tell him to go see Leela. Now, go to Al Kharid and talk to Hassan once again to receive your reward. Congratulations! Quest Complete!